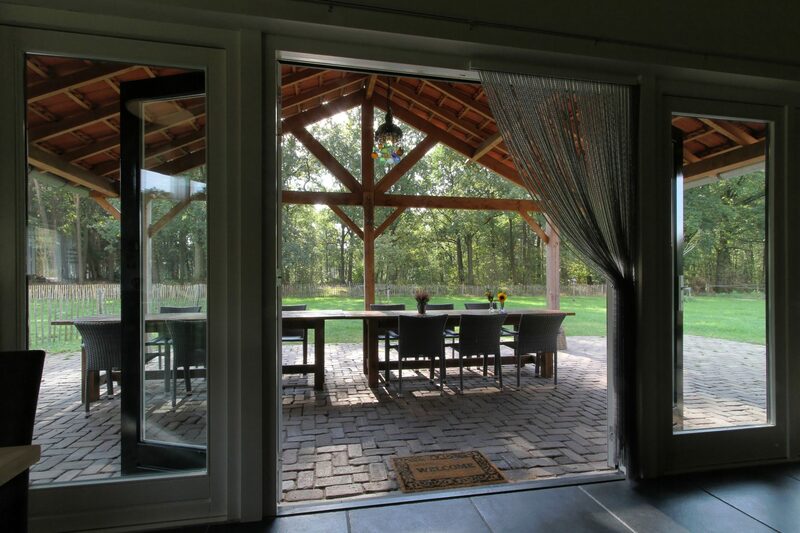 Our luxurious, smoke free group accommodation which offers space to 20 persons max and consists of 8 bed- and bathrooms, has opened its doors in 2013 and was to be established in a detached building, right at the edge of the woods of Lierop. The residence can be easily accessed by a private entrance and has its own parking bay and garden. In here you can privately enjoy the home’s luxury and beautiful environment. Your pet, after consultation, is also welcome. Our rooms are homely, and well furnished. By the time of your arrival, all the boxspring beds are already made. Every room comes with a bathroom, furnished with a shower, toilet and sink. All rooms are located on the ground floor. We own 6 two-persons rooms and two family rooms (4 persons). One of the two-persons bedrooms is linked to a bathroom equipped with all facilities for someone with disabilities. Our spacious livingroom is perfectly fitted to relax in, on one of our couches near the fireplace, and also to chat around one of the dinner tables. The livingroom also provides a view over the private terrace which is accessible via several doors. The kitchen is fully equipped for your stay. It consists of a stove, oven, coffee machine, dishwasher, microwave and refrigerator. Everything is available to your use. When requested we can provide your meals, please contact us for all possibilities. On the first floor a playroom is situated for small children as well as older ones, to enjoy themselves with several games. Ideal during bad weather. Our covered terrace is located on the south side of the property and offers a clear view on the woods. Here you can sit and relax or barbecue may you wish to. The garden consist of 1500 meters of field which is fitted for several outdoor activities. Our group-accommodation is located at the edge of Lierop, directly connected to several heathers. Our nearby and beautiful bicycle- and hiking routes are all available to your use. Among others these routes will lead you to our Prehistoric hedgerows, remains of second world war safe house “Dennenlust”, and several marshes. The routes can be provided by our staff. Other activities we can offer you are: bicycle- and mountain bike rental, Solex tours, Segway tours, paintball games and old fashioned Dutch games. Our local supermarket enables you to order your groceries, which they will then deliver to the accommodation. There is also a bakery nearby.